This is another odd CD set made in Israel by the Trumpets Of Jericho, Ltd. yet was manufactured by The International Music Company AG in Hamburg, Germany. This time the set features one disc of Judy Garland's film performances, and one of Betty Grable's film performances from 20th Century-Fox. 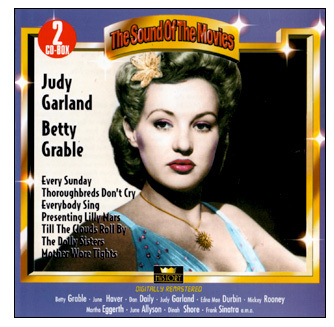 Most of the Garland tracks are copies of the Rhino Records versions (most from "Judy Garland - Collector's Gems From The M-G-M Films"). The exceptions are a few of the Till The Clouds Roll By tracks, and the entire Betty Grable CD. The sound quality on this set is inconsistent. Some tracks sound good, others sound terrible. Best to stick with the Rhino Records versions! 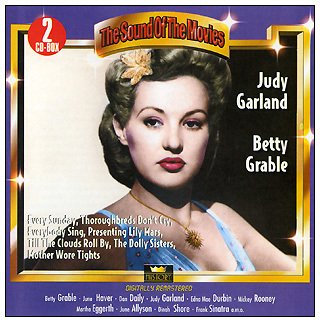 Image at right: The slightly different cover to the edition included in the boxed set of the entire "The Sound Of The Movies" CD series.